Alternate Fuel Plenums l Vortox Air Technology, Inc.
Plenums are used with the same type of equipment, often mixers, as Alternate Fuel Air Cleaners, but are needed where remote mounting is required. Plenums are placed (hard mounted) over the mixer allowing a hose to connect from the Plenum to an air cleaner. 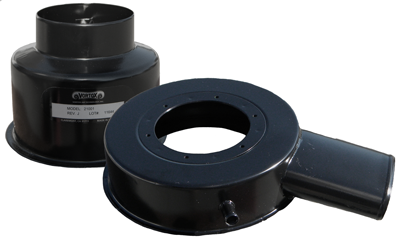 All Vortox Air Technology, Inc. Plenums are formed with Electro Galvanized cold rolled Carbon Steel and are finished in a black baked polyester coating. Customization is welcome to create a Plenum that will suit your needs.